GQ hooked up Duke’s Justise Winslow with a suit for tomorrow night’s NBA draft. In the video, GQ creative director Jim Moore and style editor Will Welch go over a few options with Winslow, before settling on a damn fine blue suit. 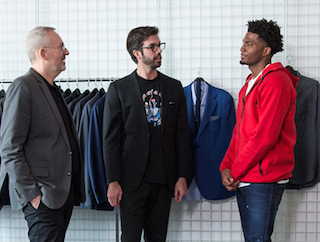 There’s a good chance Winslow will be adding a Knicks hat to that outfit, so we’re glad the kid got the star treatment from GQ. Honestly, as long as the Knicks don’t draft that over-hyped Euro player Kristaps Cornflake we’ll be happy.